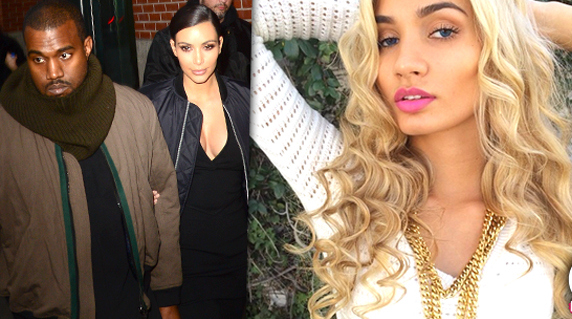 Kim Kardashian seething with jealously as Kanye West gets closer to his protégé Pia Mia. Kim Kardashian‘s dream came true this week when Vogue released the cover image of her posing in a wedding dress withKanye West. But behind the scenes, the couple’s reality is far from picture perfect. RadarOnline.com has learned that though they insist they’re more in love than ever in the weeks before their wedding, West’s relationship with his hot young protege,Pia Mia, has been raising eyebrows — and Kardashian is “jealous”! Pia, born Pia Ajdba Mia Perez, is only seventeen and “Kanye has made it clear to everyone that their relationship is strictly creative,” the insider says. But as they’ve grown closer, and the teen has become one of his trusted advisors, their relationship has raised eyebrows. In fact, the insider close to West tells Radar that he sees her as the key to keeping himself relevant and growing his career. Indeed, fans of Keeping Up with the Kardashians might recall an episode based on Kardashian’s jealousy of younger sister Kylie Jenner‘s seemingly effortless style. Mia is friends with Kardashian’s half-sister as well, and Kardashian even posted a keek video of them all hanging out last year. Pia is B A D, but i think Kanye just wants to know what all cool kids like and are doing. Kim and her crazy mama are going to end up on an episode of the first 48 if they don't chill out.